For most of my life I have known and loved Handel primarily as a composer of musical dramas: the Italian operas of (roughly) the 1710s to the 1730s, and then the English “oratorios” of the 1730s to 1750s, which, though not originally performed in staged productions, were in most cases conceived and designed in dramatic terms and have been successfully adapted to the theater. Over the last quarter I have been given three CDs of Handel’s instrumental music to review. 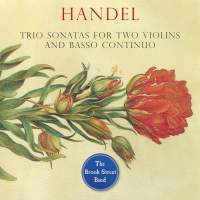 All three of them can be confidently recommended, though not always as first choices, but the present disc, of trio sonatas for two violins and basso continuo, is the outright winner of the group: the only one that absolutely knocked me sideways. Part of the reason for this may be that after opera, oratorio, and art song, my greatest love in classical music has been music for string quartets, which have always seemed to me to be the form of instrumental music that has been most successful at concentrating and communicating a composer’s interior life: his most deeply personal feelings, impressions, and reflections. The string quartet began to blossom as a musical form during the Classical period in the later 1700s. The Baroque masters—Handel, Bach, Vivaldi, and their contemporaries—did not write string quartets, but they did compose reams and reams of music for two violins and a basso continuo consisting of cello and harpsichord. Many of these trio sonatas exhibit an economy of means combined with an intensity and refinement of expression that anticipates the later achievements of the string quartet medium. And as the performances on this disc demonstrate, Handel’s compositions for trio sonata configuration, spanning about 30 years, comprise a body of work that in musical richness and diversity can be justly compared to the complete quartet cycles of Haydn, Beethoven, Schubert, and Shostakovich. The Brook Street Band (Rachel Harris and Farran Scott, violins; Tatti Theo, cello; and Carolyn Gibley, harpsichord) has previously released critically acclaimed discs of Handel’s opus 2 and opus 5 sets of Trio Sonatas. The present disc, as Tatti Theo’s booklet notes explain, is compiled of pieces that have no opus numbers, but were assigned numbers in the Händel-Werke-Verzeichnis (i.e. HWV) catalog compiled in the 1890s. Two of them, the Sinfonia in B♭and the three-movement Overture to the oratorio Esther, were not officially titled trio sonatas but are scored along the same lines. All are works of great beauty, imagination, and character, and it would be difficult to choose a favorite among them. But to give you an idea of what these works have to offer I will mention a few striking movements: the forthright, striding Allegro that opens the Sinfonia; the concluding Allegro of the B♭Trio, with its dancing interplay of violins; the hauntingly tender Largo of the G-Minor Trio, like a love duet from one of the operas; the elegant, wistful Andante from the C-Minor Trio; and the final two movements of the trio associated with (and containing musical material from) the late oratorio Saul. In the 20 years since its foundation, The Brook Street Band has been winning golden opinions in the UK and abroad for its performances of Baroque chamber music. The qualities these musicians bring to their performances are a focused enthusiasm; a refined but lively feeling for rhythms, timbres, and phrase shapes; a passion for the music they are playing; and the abiding joy and inspiration they take from playing together. In addition to their three Handel discs, they have also published two devoted to the trio sonatas of Johann Sebastian and Carl Philipp Emmanuel Bach. This is the first of their CDs I have heard, but I will definitely be seeking out the others.